Kutacane is the entry point to get to Ketambe on the border of the Gunung Leuser National Park. Flights have resumed from Medan to Kutacane and Banda Aceh to Kutacane. Previously the only way to get to Kutcane and then on to Ketambe was via a 7 hour bus trip from Medan or a longer trip from Banda Aceh. 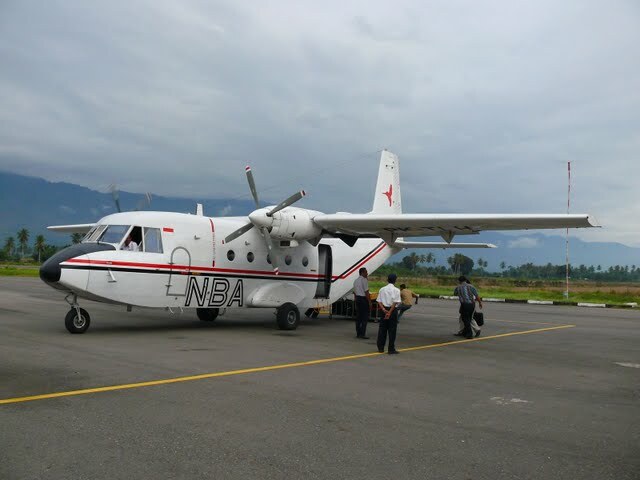 There is only one airline operating these flights, Medan - Kutacane - Banda Aceh which is SMAC - Sabang Merauke Raya Air Charter which headquarters are at Polonia International Airport Medan. There are no english websites for SMAC so you'll need to book a ticket through a travel agent in Medan or Banda Aceh. Or you can contact them direct on 0614155116 (+62 61 415 5116) - Jln Imam Bonjol 59, Medan. The planes are only small, around 23 seats so flights fill quickly. NBA is a new airline that now has flights from Medan to Kutacane. flying twice a week on Wednesday and Saturday. Flights are only twice a week, Wednesdays and Saturdays at a cost of around 114,000Rp each way Medan - Kutacane or 244,000Rp Kutacane - Banda Aceh. There are not any money changers in Kutacane so best change your money before you arrive. There is an ATM machine serviced by Bank BRI which services Maestro or Cirrus. The only credit card you can access for cash advance is Mastercard. VISA is not accepted. Maximum withdrawal per transaction is 500,000Rp.